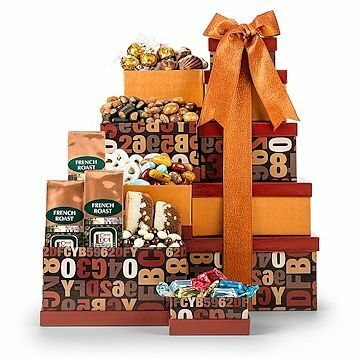 Mellow and complex French Roast coffee is paired with elite coffee-themed treats in this exclusively-designed gift tower. Triple chocolate toffee, Lindt hazelnut truffles, and chocolate covered espresso beans are just a few of the delectable indulgences they'll enjoy alongside the premium coffee. Each gift box is designed with an eye for fashion and function long after the contents have been enjoyed. Finished with an elegant hand-tied satin ribbon, it's an impressive gift for anyone who loves a sophisticated coffee experience.F ashionable coffee-themed keepsake gift boxes.